Rabbit polyclonal Myosin Light Chain 2 antibody. Validated in WB, ELISA, IHC, ICC/IF and tested in Rat. Cited in 9 publication(s). Independently reviewed in 1 review(s). ab48003 is directed against the regulatory light chain of smooth and non muscle myosin. The antibody detects both unphosphorylated and monophosphorylated forms of the protein. Our Abpromise guarantee covers the use of ab48003 in the following tested applications. WB 1/500 - 1/2000. Predicted molecular weight: 19 kDa. Arrowheads indicate the detection of both monophosphorylated (upper) and unphosphorylated (lower) forms of the protein. ab48003 (2µg/ml) staining Myosin Light Chain 2 in human skeletal muscle using an automated system (DAKO Autostainer Plus). Using this protocol there is strong staining of cell cytoplasm. Publishing research using ab48003? Please let us know so that we can cite the reference in this datasheet. Could I know the blocking reagent and the reagent for antibody dilution? and the antibody dilutions? We recommend use of a 5% non fat dry milk/TBS blocking and incubation solution. We also recommend a starting dilution for the antibody within the range 1/500 - 1/2000. This is just a suggested starting range for the product. The optimal antibody dilution may ultimately be outside of this range and should be determined in the lab. 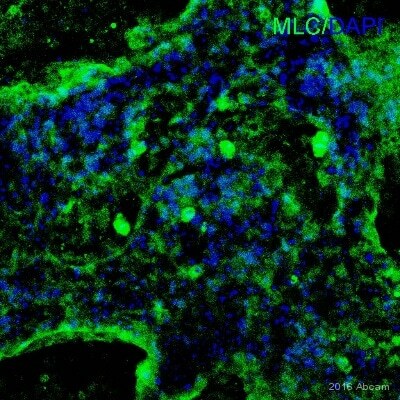 I am thinking of ordering your antibody Total MLC2 rabbit polyclonal and was wondering if you could tell me the specific sequence of the protein that it binds? will it prefer non phosphorylated over phosphorylated MLC2 forms (or vice versa) or does it equally bind the two forms? I can confirm that the immunogen for ab48003 was a synthetic peptide corresponding to amino acids 12 to 27 of Human Myosin Light Chain 2 (GANSNVFSMFEQTQIQ). The antibody therefore binds to this region. I can only confirm that the antibody bindsboth unphosphorylated and monophosphorylated forms of the protein. We assume this binding is equal, but this has not been tested experimentally. I would like to test ab48003 for use in ICC on mouse cells. DISCOUNT CODE: *** Expiration date: April 6th, 2012 I am very pleased to hear you would like to accept our offer and test ab48003 in ICC on mouse. This code will give you 1 free primary antibody before the expiration date. To redeem this offer, please submit an Abreview for ICC on mouse cells and include this code in the “Additional Comments” section so we know the Abreview is for this promotion. For more information on how to submit an Abreview, please visit the site: www.abcam.com/Abreviews. Remember, we publish both positive and negative Abreviews on our datasheets so please submit the results of your tests. The code will be active once the Abreview has been submitted and can be redeemed in one of the following ways: 1) Call to place your order and mention the code to our customer service department; 2) Include the code in your fax order; 3) Place your order on the web and enter the promotional code. Any feedback that you can provide will be greatly appreciated, whether positive or negative. If you have any further questions, please do not hesitate to contact us. We look forward to receiving your Abreview and wish you luck with your research. The terms and conditions applicable to this offer can be found here: www.abcam.com/collaborationdiscount.